I am a little bit in awe with Crimson Bound. 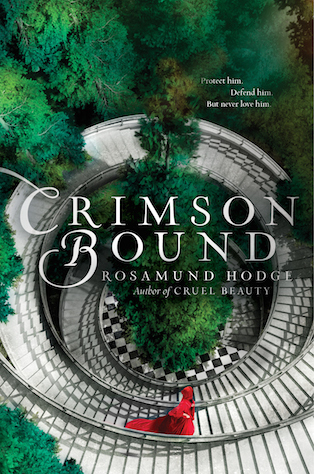 I’ve read a lot of books lately, but none were able to grab my attention and keep me captivated quite as Crimson Bound. Who ever thought a retelling of Red Riding Hood could be as unique and engrossing? I certainly didn’t, which makes me so much happier that this book blindsided me. The folklore, the characters, the crimes and the repentance… It all woven together into this perfect grimm fairy tale retelling where nothing is as it seems; there are no perfect paths to take and no perfect endings. I would recommend putting Crimson Bound high up on your reading list, because it is one of the best retellings out there. Hands down. The folklore created in Crimson Bound is dark and enchanting. I think the closest magical creature to a foretsborn is a very twisted Fae. They have the Wild Hunt, they play with humans and take them when they please. They serve a an entity that they want to bring back from the brink of death so this entity can swallow the sun and the moon and they can live in eternal darkness, hunting their human prey. And our heroine is in the beginning stages of becoming one of these heartless creatures. That just might mess with a girl’s head. In between Rachelle’s story you get small snippets of the origin story of the one that once was able to defeat the Devourer, how she managed to do so, etc. It is a very good story, and a fantastic way to show the reader the origin story without have to info dump in the middle of a chapter. First off let me state that I loved Rachelle. She is so twisted up inside; she wants to be a hero but ends up becoming a murderer. Now she spends her days saving people from the nightmares that sprout from the Great Forest in order to repent. She killed the most important person in her life in order to live and she can’t forgive herself. She spends the whole novel repenting and just being generally awesome by putting everybody before herself, sacrificing everything so the world can have another day full of light. She is not whiny (no “woeh is me” here) she just knows what she did and what she is worth, and damn whoever stands in her way of achieving her goals. She also has a soft spot for the one friend she has in the world (Amelie), and the one guy who might change shed light into her dark and twisty world. “How last winter, a forestborn had marked him. How he had refused to kill, and the mark remained black on his skin, yet he was alive to this day. Said guy is never described as being otherworldly beautiful. First time she seems him she calls him downright average looking; his most distinctive feature being his silver fake hands. Armand Vareilles is not the sum of his looks, but the sum of his intentions and wit. He is funny and understanding and will make you smile. He just steals your heart right out of your chest, right after giving you a witty retort and a half smile. Overall, I loved it all. I am so picking up Rosamund Hodge’s debut novel Cruel Beauty next! Definitely recommend, on all counts. Next Exo Facto FALL TV: Scream Queens, The Muppets, Mindy Project, & Fresh off the Boat!